British Prime Minister Theresa May is welcoming the agreement between Argentina and Britain for a new flight that will connect the disputed Falkland Islands with South America. The service to the Brazilian city of Sao Paulo via the Argentine city of Cordoba is being promoted as part of a thawing of tensions. The two countries went to war over the South Atlantic archipelago in 1982. May is the second prime minister to visit Argentina and the first to visit Buenos Aires since the brief but bloody war. Argentina still claims the islands, which it calls the Malvinas. French President Emmanuel Macron says he pressed Saudi Crown Prince Mohammed bin Salman to allow international involvement in the investigation into the killing of journalist Jamal Khashoggi. Macron confronted the crown prince at a Group of 20 summit in Argentina. Macron said Saturday that in the exchange, he also pushed bin Salman to help find a political solution to the Saudi-backed war in Yemen, and to help stabilize world oil prices. Macron said the crown prince only “took note” of his demands. Macron expressed hope that bin Salman would respond soon. U.S. intelligence agencies concluded that the Saudi prince ordered the journalist’s killing, which Saudi Arabia denies. Khashoggi was killed in the Saudi Embassy in Istanbul Oct. 2, a death that shocked many world leaders sitting around the table with bin Salman at the G-20. The head of the International Monetary Fund is warning that trade tensions threaten global economic growth. Lagarde said that tariffs already in place or announced would reduce global economic growth by 0.75 percentage points by 2020. The IMF currently expects the world economy to grow 3.7 percent each year from 2018 to 2020. She issued the statement at the end of the Group of 20 summit in Buenos Aires. Leaders of the Group of 20 have agreed to fix the world trading system — but only 19 of them agreed to support the Paris accord on fighting climate change. The statement acknowledges flaws in the world trading system and calls for reforming the World Trade Organization. It doesn’t mention protectionism however, because negotiators said the U.S. had resisted that. German Chancellor Angela Merkel says she hopes a meeting between the U.S. and Chinese leaders will help resolve trade tensions between the two countries. She added that the participants agree reform of the World Trade Organization is needed, and says: “We will send a clear signal — in any case, most of us” for the success of global climate talks starting in Poland on Sunday. Chancellor Angela Merkel’s spokesman says the German leader has voiced her concern about rising tensions in the Kerch Strait off Crimea and pushed for “freedom of shipping into the Sea of Azov” at a meeting with Russian President Vladimir Putin. Merkel met Putin early Saturday on the sidelines of the Group of 20 summit in Buenos Aires. Spokesman Steffen Seibert says their talks centered on Syria and the current tensions between Russia and Ukraine. Germany and France have sought to mediate between Russia and Ukraine. European diplomats say all-night talks at the Group of 20 summit have resulted in a possible “breakthrough” on fixing the global trading system. Despite deep divisions going into the summit and resistance from the U.S., European Union officials said Saturday that countries also are making progress on a final statement that will acknowledge problems with the World Trade Organization but commit to reforming it. President Donald Trump has criticized the WTO and taken aggressive trade policies targeting China and the EU. One EU official told reporters that the G-20 summit’s final statement is likely to show 19 members supporting the Paris climate accord, with the U.S. stating its opposition to it. The official said the U.S. delegation also held up discussion of how to manage refugees and migrants, but that the final statement is expected to mention the need to manage migration on a global level. The Group of 20 summit is entering its crucial second and final day with hours left for diplomats to bridge divisions on major issues including world trade, climate change and tackling migration. 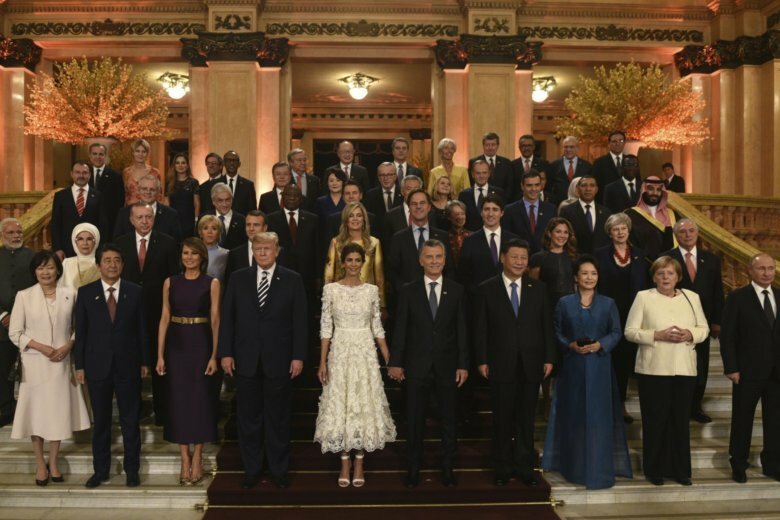 The divisions among the world’s leading economies have been evident from the moment Argentina’s president opened the summit Friday with a call for international cooperation to solve the planet’s problems.